With six million accident-free miles driven, 14 U.S. Xpress safety awards received and 29 years spent on the road together as a team, Danny and Cindy George exemplify exactly what it means to be Citizen Driver honorees. After growing up in trucking families, their worlds collided nearly 30 years ago while working for Texas Intermountain Transportation, a trucking company in Commerce City, Colorado. They decided the best way to get to know each other was to hit the road together, and so they did. Living together in a space the size of a walk-in closet for 29 years is a challenge, but Danny and Cindy George make it work effortlessly. While one drives, the other sleeps. These two are best friends, and each year that they spend together brings them even closer. Even when they aren’t on the road for work, they’re still traveling together. To date, they’ve been to over 30 countries and all seven continents. Wherever they go, they enjoy the beauty of different cultures, food and scenery, while sharing all of their experiences on their blog. 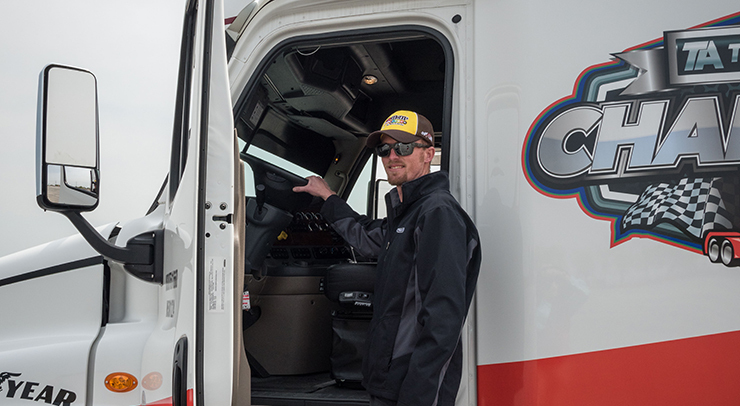 Their Adventure Trucking blog takes you inside all of the Georges’ adventures, on the road and all over the world. They also use this platform to share dietary tips, exercises and healthy choice recipes for the road with other professional drivers. In an industry that isn’t typically recognized as the most health conscious, Danny and Cindy’s healthy habits on and off the road are inspiring to everyone they meet. In 2006, Danny completed the Rock-N-Roll Marathon but didn’t stop there. In 2016, he completed the half Ironman, which consisted of 70.3 miles of swimming, cycling and running. Danny and Cindy remain dedicated to staying healthy and fit. They keep bikes on their truck and are always looking for the best spots to run or bike as they run their routes. The Georges were also two of the first members of the Truckin’ Runners Facebook group. Members of this group share training tips, race information, nutrition, music playlists and offer advice and support to one another. This power couple isn’t stopping at Facebook groups and blogs to promote their message of living a healthy lifestyle on the road. They are currently writing a book on driver health, and a major component of it will highlight places where professional drivers can park your truck and exercise. Follow along with their Trucker Trails blog for a sneak peek of what you can expect to see in their upcoming book. Danny and Cindy George are not only leaders when it comes to representing health and wellness, but also when it comes to safe driving and giving back to local and global communities. After earning their One Million Mile award with U.S. Xpress in 2008, the couple has since won an idle-reduction contest, a Zero Defects award and they were invited to participate in two round-table safety discussions. They were also named Team Drivers of the Month twice, most recently in March 2017. Danny and Cindy George give back to their community by sending aid to organizations like Insight for Living, Samaritan’s Purse, KTLF Christian radio and more. They also help out with the Denver Rescue mission and Salvation Army and support the global community by donating money to help children in Kenya. Do Danny and Cindy’s accomplishments remind you of someone you know? Nominate them for our next group of Citizen Drivers. We will begin accepting nominations for the 2019 Citizen Driver honorees on June 1.